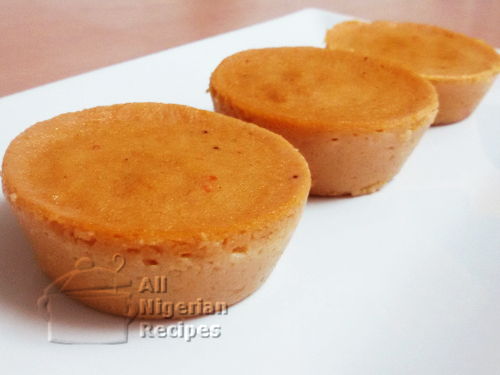 By baking Nigerian Moi Moi in the oven, I get these cute cup-sized Moi Moi that kids love. They are also the perfect size for when you have guests. The red bell pepper is to add colour and a nice flavour to the baked Moi Moi. Use Tatashe if you are in Nigeria, if these two are not available to use, use tinned tomato puree. But use that sparingly else the Moi Moi will have a tangy tomato taste. You can also use beans flour to prepare this. See the procedure at: Cooking Nigerian Moi Moi with Beans Flour. When grinding the beans, use just enough water to help the blades of your blender rotate. For a delicious taste, use tasteless and odourless vegetable oils like the vegetable oils sold in Nigeria and sunflower oil. Do not use olive oil. You can use containers in different shapes and sizes to bake Moi Moi in the oven but bear in mind that if you use say a cake pan and fill it with Moi Moi mix, you will need to bake the Moi Moi for much longer than the 45 minutes I stated below. The 12-cup muffin tray takes about 600 mls of Moi Moi mix. See consistency in the video below. Set your oven to 200°C, 390F or Gas Mark 6 to preheat. Set it to bake that is, top and down heating. Rub vegetable oil in the muffin cups. Pour the Moi Moi mix into the muffin cups. Cover with aluminium foil and fold the foil into the sides of the muffin cup. This aluminium foil prevents the Moi Moi from drying up. Pour some water in the oven tray and place the muffin tray with the Moi Moi mix in the tray. Bake in the preheated oven for 45 minutes. Check it from time to time to ensure there is always water in the oven tray. If it looks like it is drying up, top up the water. When done, leave to cool down completely and bring them out from the muffin cups. Serve immediately or store in the freezer. Nigerian Moi Moi stores well in the freezer. Serve with Peppered Fish. I love baking Nigerian Moi Moi in the oven especially these cute muffin cup sizes because my daughter loves it for breakfast on a school day. I make several batches of this and store for her in the freezer. Watch the video below to see how I stack them in a container before freezing them. All I do is bring one out and leave on the kitchen counter to defrost (usually takes about 20 minutes), then I warm it up in the microwave oven on medium heat and it's ready for her to eat. If you have any questions about baking Nigerian Moi Moi in the oven, click here to ask me.